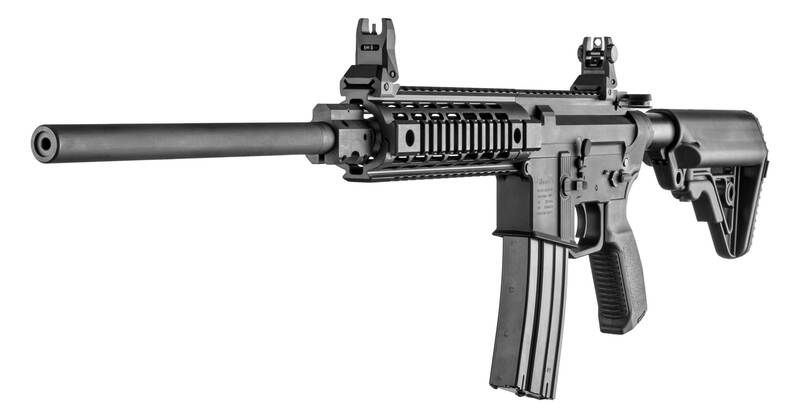 The Gilboa® DMR is based on the same hard-running platform of the Gilboa® rifle. The DMR is a heavily modified Gilboa® semi-auto rifle, designed specifically for increased accuracy. The DMR is fitted with a heavy match barrel for better harmonics and has a 1:7 twist. This twist rate is idealized for using heavier grain ammunition (62-77 grains) but all projectile weights of .223 REM ammunition can be fired from the DMR barrel. The muzzle of the barrel is crowned for accuracy. •	Light weight and convenient mobility. •	Accuracy while maintaining operational role ability. •	Common ammunition and magazine. •	Quick and easy magazine change. •	Operators face safely away from chamber (safe from catastrophic chamber failure and gases.